Flap copy: On a cold December night, a baby mouse is born. The winter wind blows the tiny mouse nest apart, and Mother Mouse, with her shivering mouseling, sets out in search of a warm shelter. From the top of a hill, Mother Mouse sees a halo of light and follows it to a wooden shelter. Inside, a special child is born, and the Christmas Mouseling, nestled in the manger, is warm at last. Dori Chaconas’ lyrical text joins with Susan Kathleen Hartung’s tender illustrations to poignantly capture the wonder of the Nativity story. Editor: "You mean the baby mouse is pink and naked and squirmy? Editor: "E-wwwwwww! And what happens with this naked, squirmy mouse?" Me: "He's born in the cold of winter and Mother Mouse needs to find a warm place for him. She searches and searches, then finally comes to the manger, with the Baby Jesus tucked in under a warm blanket. She peeks under the blanket and sees ten other pinkies. She thinks those pinkies are other baby mice." Editor: "Let me guess. The mother mouse sticks her baby mouse in between Baby Jesus' toes." So, respecting my editor's sensitivity to things squeamish, the baby mouse instantly grew soft fur, and was not allowed to even touch Baby Jesus' toes. Christmas Pinky became Christmas Mouseling. 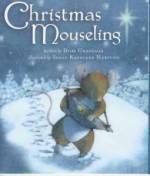 A mother's love shines in Chaconas's sweet Nativity story starring a pair of mice. Mother Mouse welcomes her new baby during a blustery storm that destroys their snug nest ("The north wind blew./ The snowflakes flew. / The mouseling sneezed, Ah choo! Ah choo!"). Seeking shelter, she follows other animals going "to see a king." Hartung's chilly images painted in oil glaze and a bevy of swirling snowflakes on a backdrop of blue turn to burnished hues of gold as the pair enters the welcoming stable, where the mouseling nestles next to the infant in the manger. Copyright © Reed Business Information, a division of Reed Elsevier Inc. All rights reserved. A mother's tender love and concern for her newborn is the theme of this sweet Christmas story with a well-written, traditional structure and inventive illustrations. As Mother Mouse carries her newborn mouseling through the snow-covered fields searching for a safe haven, she meets several animals: a sheep, a dove and a cow. Each one offers its home to the mice, because the animals are leaving "to see a king." A repeated refrain of blowing wind, flying snow and sneezing mouseling causes each borrowed home to blow apart, so the two mice eventually follow the other animals toward the star and the stable. There they borrow a corner of the Christ Child's blanket and receive a kind word from another mother with a newborn. Hartung's illustrations provide a properly appealing Mother Mouse, who carries her baby out into the world in a sling made of a seed pod. Many pages use large snowflakes layered over the panoramic views, and the repeated refrain is creatively incorporated within the illustrations along pastel blue swirls to indicate the whirling winter winds.